Few days back I never knew that I can connect my iPhone to my laptop and use unlimited GPRS plan that I am on with Airtel on my laptop but ever since I have got to know that I am just loving surfing on my laptop for just Rs 98 / month which is the Airtel’s unlimited GPRS plan. Download and Install latest version of Apple iTunes which is 9.0 (when writing), if possible, because with previous versions you will have to modify settings in iTunes to get it worked. You must also have iPhone 3.0 for following settings. 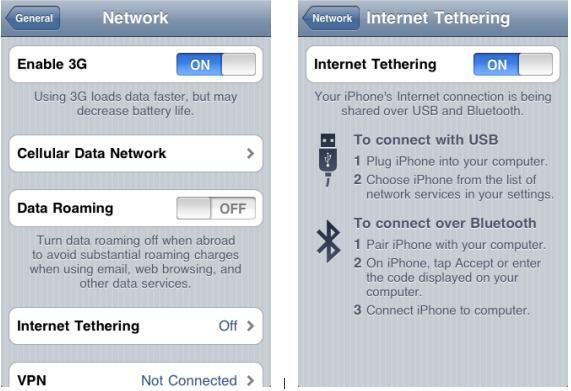 Locate “Internet Tethering” and turn it ON. You may receive an alert that your BlueTooth is not switched on, for which you can either switch it on or leave it as is. You should now connect your iPhone to your laptop. 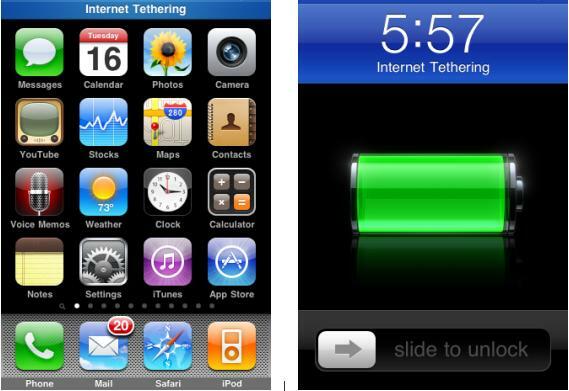 Your iPhone will display a blue background banner on different screens to indicate that tethering is active and running as shown below. I then opened up my web browser and tried google.com and to my surprise it worked. Now I can surf unlimited internet for just Rs 98. You may not get best speed but it is not bad either. This is amazing? Try it yourself. dude based on fair use policy…. try using it by downloading 100 GB a month..